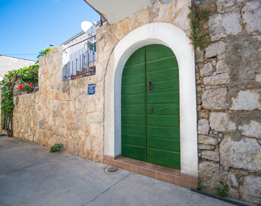 The house is located in the old center of the village of Murter in the beautiful island of Murter. It has two floors and two terraces. In the ground floor there is a courtyard-type terrace, the kitchen, the living room and the bathroom. The stairs lead from the bottom terrace to the top terrace, which has a view of the sea. From the top terrace one enters the top floor which has two bedrooms and a toilet. One bedroom has a double bed, and the other one has two single beds. In the downstairs living room there is also a pull out sofa which can be used as a bed for two additional guests. Although the renovations have tried to keep the traditional feel of the house, it has all the modern amenities. The kitchen has all the cooking utensils you could need, a fridge, an oven, a microwave and a dishwasher. The bathroom is rather spatious with a bathtub and a washing machine. The house also has air-conditioning, a large LCD TV with cable TV, and a free Wi-Fi connection. The location of the house is wonderful for a relaxing holiday in one of the most beatiful regions of the Croatian seaside. The village itself is nice, you are just a stroll away from all the restaurants, bars, stores, bakeries and the market filled with local produce. The pebbled beach is 400 m away, which is a great option for families with smaller children. The island has several exceptional beaches which are famous for their beauty, and they are all within the driving distance of 5 to 10 minutes. You can also rent a boat or an excursion to the nearby Kornati national park, which is an archipelago of 170 mostly uninhabited small islands, surrounded by the clearest, bluest sea you can imagine! Getting around Concerning your arrival to the village, Murter is an island, but it is connected to the landmass with a bridge which is toll-free, so there are no traffic problems and jams which usually occur with ferries. The important thing to know is that during the summer every day between 9 and 9:30 and between 17:00 and 17:30 the bridge opens to let the larger boats pass through, so the car traffic is closed during these periods.The closest airport is in Zadar, 68 km away.As our house is located in the historic part of the village, it has no parking directly in front of it, but there is a big public parking located 200 m away, a 2 minute walk. You will receive a parking card issued to your car registration number free of charge. Points of interests Murter is the largest settlement on the island of the same name, which has the greatest number of islands in its archipelago (over 170), with a large number of sandy beaches along its coastline (Čigrađa, Slanica, Podvrške…), as well as numerous interesting destinations in its vicinity (the national parks: Kornati, Paklenica, and Krka; the nature parks of Telašćica and Vransko Lake; the cities of Zadar, Šibenik, and Split). Specialized restaurants and inns offer a wealth of gastronomic specialities. The remains of Roman buildings, as well as the remains of the antic settlement Colentum, can be found at the foot of the Gradine elevation, in the Hramina cove and elsewhere.